creative savv: And the flavor of the month is . . .
And the flavor of the month is . . . This week we've had pumpkin granola, pumpkin muffins, pumpkin soup, pumpkin oatmeal, and yesterday afternoon I popped two loaves of pumpkin bread into the oven. Remember last month, I bought about 6 (I'm not even sure any more, there have been just so many pumpkins in my kitchen) sugar pie pumpkins at the produce stand, to add to my 5 pumpkins from the garden. And then on Black Friday, making my usual Black Friday rounds, I picked up 10 sugar pie pumpkins, absolutely FREE! I have spent years cultivating my knowledge of all the Black Friday freebies. Our first stop is a multi-purpose store that offers free donuts, coffee and juice. Yes, please! We go, have our free breakfast and watch all the semi-sane people fill their carts with all kinds of stuff they may or may not really need. It's great entertainment! I also pick up socks for the family (always a half price deal on Black Friday at this store) and check around for any outstanding deals on items I've been looking for. Then right across the street is a nursery/decor store that puts on a fabulous Christmas display each year. In order to transition over to Christmas, they have to unload all their autumn decor, which includes a bunch of squash, pumpkins and corn stalks. Black Friday is the day I cruise by to see if they have any pumpkins out for the taking. And again this year, they had a huge pile of sugar pie pumpkins with a big FREE sign. I took 10. That was about all I really wanted to have to deal with this year. So, I've been cooking all these pumpkins up, two at a time. 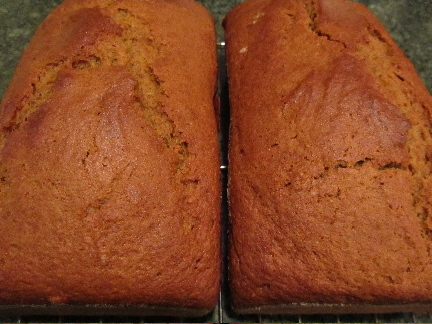 Then after baking, I put them in the fridge and the next day bake two more. This way I can run 4 pumpkins through my food processor at a time. Then only have to wash up the machine once for those four. I should be done with the pumpkins in another week. I have frozen several containers of pumpkin puree to use later in winter. I've also have been using it in our everyday meals, as another way to sneak in a vegetable. But the truth is, we love the flavor of pumpkin! So, the other day I was making muffins when my son came in. He asked what flavor they were. I answered, "pumpkin! Is there any other flavor?" His reply, "well there's turkey." Don't know how well turkey muffins would go over. If I try them, I'll let you know. It's one of those local freebies that I really look forward to. And later this winter we'll appreciate all the pumpkin puree in the freezer. How great that they offer those pumpkins for free! Pumpkin is delicious in baked goods, and I love making soup from it. I'll saute some garlic and onion in olive oil, add the pumpkin and chicken or vegetable stock (about 4-6 cups depending on the amount of pumpkin used), and then add curry, cumin, and turmeric and let it cook until it gets to the consistency I want (I tend to like thicker soups). that soup sounds yummy! I like the thicker soups, too. I usually add a cubed potato to pumpkin soup to help thicken it. I know the nursery of which you speak. I was just there this Tuesday looking for bird themed ornements. Their displays are so pretty. Next year I'll check out the free pumpkins too. Don't their displays look especially good this year? Wight's is on my way to/from my daughters' school, so we try to stop in every other week for a peek at everything. For the free pumpkins, squash and/or corn stalks, try to swing by there by about 9 AM on Black Friday. I think we were there around 8 or 9 this year, and there were still a lot of pumpkins remaining. This Pumpkin Spice Trifle might make a great dessert for a special meal, too. Oooh! A pumpkin trifle. I'll check out that recipe. I bet you could make a yummy luncheon cheese muffin and add some cooked turkey. And follow it up with pumpkin pie ... or trifle ... or bars for dessert! a savory muffin with a bit of turkey might work! It sounds good. If I make some I'll let you know. I find washing my food processor a hassle also. I understand you saving the cooked pumpkins up to puree. Most of the parts can go in the dishwasher, but the bowl itself is developing a crack, so I hand wash it -- pain. I try to make my work as simple as I can, given my budget challenges.